August 13 marks an important day in Marine Corps history—the enlistment of the first female Marine, Opha Mae Johnson. 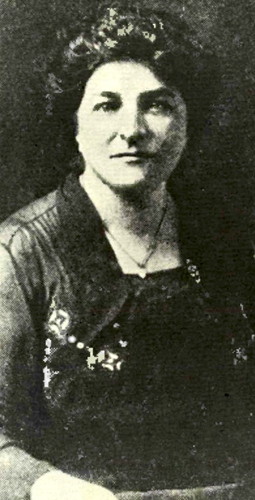 Opha Mae Johnson (née Jacob) was born in Kokomo, Indiana in 1879. She graduated from the Shorthand & Typewriting department of Wood's Commercial College in 1895. In 1898, Opha Mae Jacob married Victor Johnson, who was the Musical Director of the Lafayette Square Opera House in Washington, D.C. at the time. Prior to serving in the Marine Corps, Opha Mae Johnson was in the Civil Service, working for the Interstate Commerce Commission. In 1918, as World War I was coming to an end, the number of male Marines deployed overseas led to the Marine Corps allowing women to enlist for the first time, filling the vacancies (primarily administrative) left by the deployed Marines. On August 13, 1918, approximately 300 women enlisted in the Marine Corps reserves, with Opha Mae Johnson being the first. Her first duties were as a clerk at the Headquarters of the Marine Corps (HQMC) in Arlington, Virginia, managing the records of other female reservists. After World War I ended in late 1918, all branches of the service, including the Marine Corps, began steadily disenrolling women, and Johnson ended her time in the Corps in 1919. Later that year, on July 11, the American Legion granted a charter to the first post of female Marine reservists. The post was known as Belleau Wood Post No. 1. The post's membership consisted of 90 women who had worked at HQMC, including Opha Mae Johnson. In the almost-century since Opha Mae Johnson first enlisted in the Marine Corps, women have, and continue, to proudly serve our country as U.S. Marines in every major conflict and, since Congress passed the Women's Armed Services Integration Act in 1948, during times of peace as well. While gender-integration would have happened eventually, the willingness to serve (and aptitude with which they did so) of trail-blazing women like Opha Mae John and her fellow enlistees back in 1918 (and of the women who enlisted during World War II) surely sped this proces up. Today, women make up nearly eight percent of the Corps and serve in 93 percent of all occupational fields and 62 percent of all billets. And, with the announcement in early 2016 that the Corps is to introduce gender-neutral job titles by April 2016 while simultaneously opening approximately 225,000 previously male-only jobs to female Marines, women in today's Corps have more opportunities than ever before.